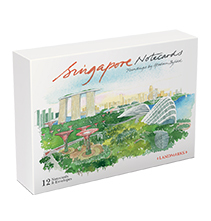 This box contains 12 delightful notecards depicting 12 landmark sites in Singapore. Painted by Graham Byfield, each has been chosen for its historical, cultural or architectural significance. Representing the diversity of Singapore, there are Indian, Malay and Chinese buildings, along with some magnificent edifices dating from the colonial era.